On April 14, 2014, over 300 girls were kidnapped from a school in Chibok, Nigeria by a group of Islamist militants called Boko Haram. Some girls escaped. An estimated 276 girls are still missing. No one knows where they are currently located. The masses have tried to give a voice to those missing with #BringBackOurGirls. It has been shared over airwaves, celebrity social media feeds, and dinner tables as people watched the nightly news. Each individual trying to help is important. But, it is the voice of 15-year-old Deborah Peter that we should pay extra attention to. Her message is slightly different — #BringBackMySisters. Peter is a survivor of a different Boko Haram attack. On Tuesday, she shared her story with the U.S. House of Representatives — and the world. On December 21, 2011, three men came into Peter’s home. They asked her father to reject his Christian faith, and when he refused, they shot him. Next they killed her brother, who was only a child. After witnessing these crimes, Peter was forced to lie between the bodies of her father and her brother. To keep Peter safe from future Boko Haram attacks, a pastor paid for Peter to escape from Nigeria. He died two years later. She has since found refuge in Grundy, VA at the Mountain Mission School. 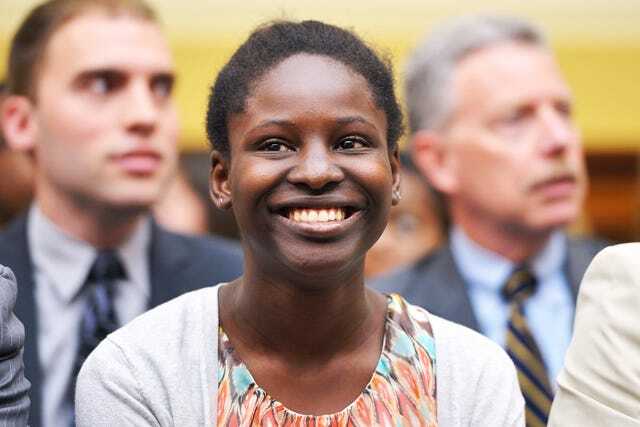 She thanked her school for “being a home to me in America.” The education she had to flee her country for has now become her sanctuary. While the girls she had to leave behind — she knows at least one of the missing girls — have become bargaining chips in an ongoing ideological war because they were also trying to find a future through education. Peter has lost a lot: her family, her innocence, and her home. But, she hasn’t lost her bravery or her voice. It was hopeful that #BringBackOurGirls trended. But, it’s more important that there are people like Peter to remind us that girls are being silenced every day. This is not an isolated case. Boko Haram has been targeting Nigerian females for years, recently at an escalated pace. On May 8, the insurgents reportedly kidnapped another eight girls. And, this is just the actions of one group, in one country. The destruction of people’s freedoms, often targeting females, is happening all over the world. We saw this last year when Malala Yousafzai brought attention to the struggles females trying to get an education in Pakistan face, and this experience is similar for girls in Afghanistan, Bangladesh, Chad, and other countries all over the world. People are being silenced. We should try and give them a voice. But, more importantly, we should listen to those speaking up for them. When Peter went before the government, she was more than a face for the missing girls in Chibok. She became a symbol of the resilience of humanity and the power one person can have. Some might argue that she is only one 15-year-old girl. But, for 276 girls, she is a sign of hope. She escaped the very group that is tormenting them, and went on to have her story heard by the world. People are calling her father and brother religious martyrs. Let’s hope Peter’s words can help the fight in preventing any more martyrs being created at the hands of Boko Haram.